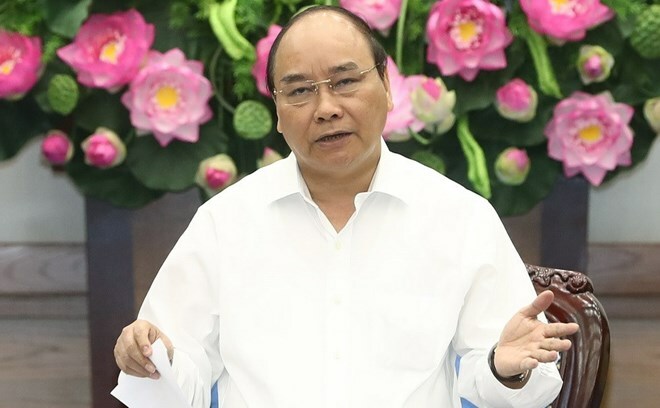 Hanoi (VNA) – Prime Minister Nguyen Xuan Phuc urged ministries, departments and localities to concentrate on addressing administrative procedure problems, especially removing tax and fee burdens imposed on businesses, while chairing the government’s regular monthly meeting in Hanoi on August 30. He asked the Ministry of Finance and the Ministry of Transport to review current regulations on build-operate-transfer (BOT) fees to pave the way for business development. The PM expressed his dissatisfaction over the fact that up to 35 percent of import-export goods batches still suffer from specialised inspection costs, while the target is only 15 percent. He also cited the World Bank’s report that Vietnamese businesses have to pay social insurance premiums 12 times per year, equivalent to 189 hours, whilst it takes only 48 hours in Thailand and 46 hours in Indonesia. “This is one of the obvious issues that ministries and departments have to address as soon as possible,” he said, adding that concrete measures are needed to remove difficulties for specific fields. Evaluating the socio-economic performance in the first eight months of 2017, the PM recognised positive outcomes in the macro economy. The inflation was curbed while the consumer price index (CPI) increased by 0.92 percent in August and 3.84 percent in eight months. Vietnam recorded strong export growth of 18 percent in January-August. The country served the highest volume of international tourists in August (1.23 million), helping the total foreign arrivals over the past eight months expand by 30 percent. The newly-registered and increased foreign direct investment (FDI) and shares capital were estimated at over 23.3 billion USD. In the past eight months, over 104,000 new businesses were set up. As the APEC Economic Leaders’ Meeting is taking place in the central coastal city of Da Nang in November 2017, the PM directed the Ministry of Foreign Affairs to ensure the best preparation for the event. During the meeting, the Ministry of Finance will brief the implementation of the State budget in 2017 and estimates for 2018, and a draft plan for the State finance and budget in 2018-2020, and the central budget allocation for 2018.